Last year I saw a video of a guy flying a remote control helicopter upside down… A HELICOPTER… UPSIDE DOWN! I watched that video and others like it over and over. So I started saving my money and researching what kind of equipment I needed to learn how to do that myself. I started off with a cheap toy helicopter, then moved to a more expensive one that was much more powerful but still a toy and then finally with a hobby-grade collective pitch heli. There is such a huge difference between a “Hobby-Grade” and a “Toy” RC vehicle. Mainly it is the ability to fix it and upgrade it, you usually cannot do that with a toy, and hobby-grade usually also means more power. I bought a Spektrum DX6, not the DX6i, but the new DX6 with the really nice gimbals, voice, and 250 plane memory. It is my first real transmitter so I do not have anything but toys to compare it to, but I really like it. The helicopter I chose was the Blade Nano CPX, it is a tiny (nano) collective pitch helicopter that is capable of flying upside down. But a funny thing happened. As soon as I had the Nano CPX I started watching videos of guys racing quadcopters through the woods. Racing through the woods flying quadcopters in first-person view while wearing goggles is so amazing! So immersive! Better than any video game could make it. But there I sat with all this money sunk into a helicopter. I decided to learn to fly the helicopter until I could successfully fly it upside down, then I would move onto quads. After crashing a lot and spending a lot of money on replacement parts I broke down and bought the Phoenix RC software because it has the Nano CPX in it. I was really impressed by Phoenix because I crashed the heli in the app in the exact same way that I crashed it in real life. I spent a hundred hours or so practicing in the software and slowly got better with the real thing. I never got good at flying the helicopter; it was too fast for me to fly it indoors but so light that it was difficult to fly outside. And the cost of repairs was crazy, I spent more on replacement parts in a couple of months than I spent on it new. At that point it just wasn’t fun. I went to a couple of local events with guys flying large helicopters doing all kind of amazing tricks, their skills are amazing and exciting to watch. But my desire to fly helicopter is totally gone. I was able to fly it upside down a couple of time successfully and I will probably never fly it again. I will probably sell it and all of the parts I have for it soon. Let me know if you are interested. Now I am on to flying quadcopters. More about that soon. Posted in Electronics. Tagged helicopter, RC. What the heck is Joe Ledger doing in a Peter Clines novel, haha, I jest. 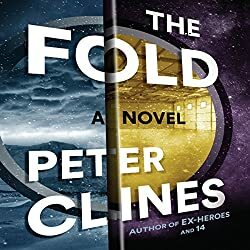 I really enjoyed 14 by Peter Clines and when I saw his new novel The Fold in Audible I grabbed it and gave it a listen. The audiobook is narrated by Ray Porter who also narrates the Joe Ledger series by Jonathan Maberry so when I hear his voice I hear the voice of Joe Ledger. But this book is not much like the Ledger series. The lead character, Mike Erikson, is a really smart guy with a photographic memory and Peter Clines does a great job of making him likeable and relatable. This book didn’t get me too excited, I enjoyed it, but it fell like a compilation of other sci-fi books and movies. There is nothing new here if you have been reading and watching science fiction for awhile. But it is a solid effort, the narration is great, and the characters are fun if a bit predictable. Step into the fold. It’s perfectly safe. The folks in Mike Erikson’s small New England town would say he’s just your average, everyday guy. And that’s exactly how Mike likes it. Sure, the life he’s chosen isn’t much of a challenge to someone with his unique gifts, but he’s content with his quiet and peaceful existence. That is until an old friend presents him with an irresistible mystery, one that Mike is uniquely qualified to solve. Far out in the California desert, a team of DARPA scientists has invented a device they affectionately call the Albuquerque Door. Using a cryptic computer equation and magnetic fields to "fold" dimensions, it shrinks distances so a traveler can travel hundreds of feet with a single step. The invention promises to make mankind’s dreams of teleportation a reality. And, the scientists insist, traveling through the door is completely safe. Yet evidence is mounting that this miraculous machine isn’t quite what it seems – and that its creators are harboring a dangerous secret. As his investigations draw him deeper into the puzzle, Mike begins to fear there’s only one answer that makes sense. And if he’s right, it may be only a matter of time before the project destroys…everything. A cunningly inventive mystery featuring a hero worthy of Sherlock Holmes and a terrifying final twist you’ll never see coming, The Fold is that rarest of things: a genuine pause-resister science-fiction thriller. Step inside its audio and learn why author Peter Clines has already won legions of loyal fans. I rate The Fold a 6 out of 10 and recommend it to anyone who has run out of other books to read. I have been hearing about The Martian from a lot of friends over the last couple of months and it sounded to god to be true so I put it off. I really shouldn’t have. I bought the audiobook from Audible and listened to it about as fast as I could. It has a lot in common with the many recent stranded stories like Gravity and Cast Away, but it is so much better than them. 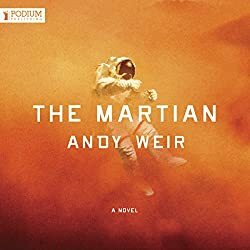 I highly recommend this book to anyone who has ever dreamed of Mars, being an astronaut, an engineer, or a space botanist. Really I recommend it to anyone at all, it is a great story and R. C. Bray does a fantastic job narrating the audiobook. After a dust storm nearly kills him and forces his crew to evacuate while thinking him dead, Mark finds himself stranded and completely alone with no way to even signal Earth that he’s alive – and even if he could get word out, his supplies would be gone long before a rescue could arrive. Chances are, though, he won’t have time to starve to death. The damaged machinery, unforgiving environment, or plain old "human error" are much more likely to kill him first. But Mark isn’t ready to give up yet. Drawing on his ingenuity, his engineering skills – and a relentless, dogged refusal to quit – he steadfastly confronts one seemingly insurmountable obstacle after the next. Will his resourcefulness be enough to overcome the impossible odds against him? I rate The Martian a 10 out of 10 and recommend everyone give it a read.